Located right below Half Dome and Glacier Point, Half Dome Village is the largest lodging facility in Yosemite National Park. Formerly known as Curry Village, or “Camp Curry” as it was often called, Half Dome Village is the perfect place for families to eat, sleep and recuperate before heading back out to explore Yosemite National Park. 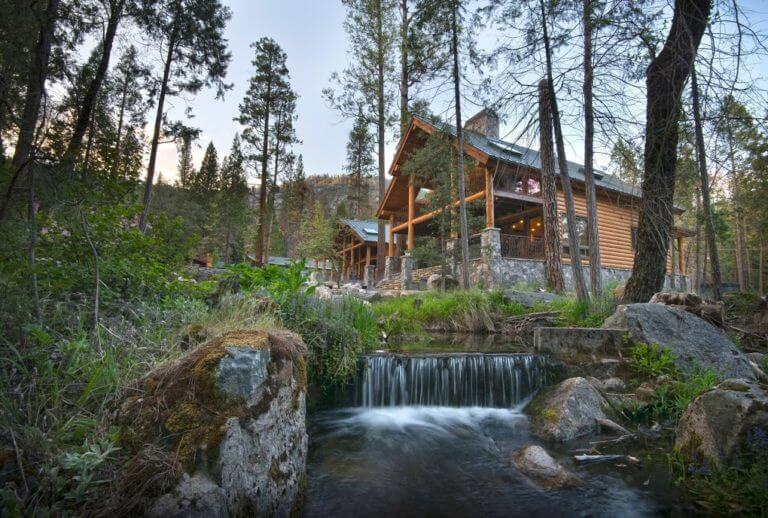 Half Dome Village is located in Mariposa County’s Yosemite Valley and features standard hotel rooms, wood cabins and canvas tent cabin accommodations, as well as a number of great dining options and other family-friendly activities. Half Dome Village is a popular destination in Yosemite National Park and its central location makes exploring the area a breeze. The activity services offered through Half Dome Village range from Half Dome Village Raft Rentals, the Half Dome Village Bike Stand in the warmer months and even a Half Dome Village Ice Skating Rink in the cooler months. Visitors staying in the area have something to do no matter what season they come. 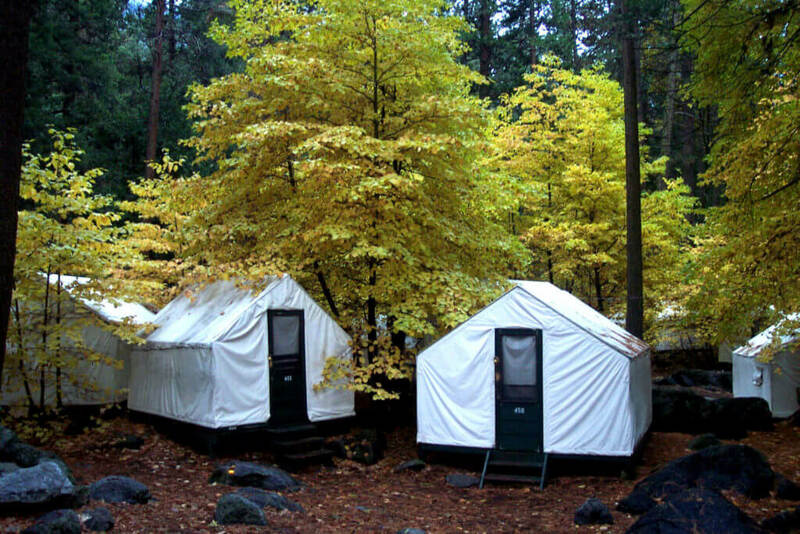 Half Dome Village was founded 1899 by David and Jennie Curry and was originally comprised of a dozen tents with a central area where guests could gather together for meals. Unsurprisingly, the beautiful location and affordability of Half Dome Village inspired quick growth to the area, eventually becoming home to several hundred more tents. From here, a dance hall pavilion was erected (and still stands! ), a pool hall was put into place and an ice skating rink was added. Today, Half Dome Village consists of Yosemite cabins with private baths, cabins that share a bathhouse and canvas tent cabins. The dance pavilion, known as Stoneman House Lodge, boasts an additional 18 rooms and is the only motel in Half Dome Village. Other Half Dome Village amenities include daily housekeeping, fresh towels as needed, extra blankets available at the front desk and ADA accessible rooms. Don’t worry if you’ve forgotten something. Half Dome Village is an extremely welcoming and hospitable place. If your neighbor doesn’t have something you can borrow, check out the Half Dome Village registration office, or front desk, as previously mentioned. 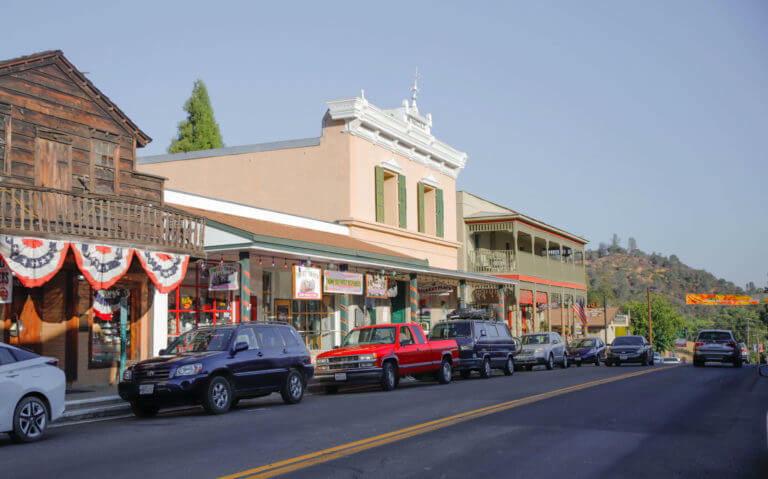 They can guide you to one of the many places in the village that sell must-have camping gear, like The Mountain Shop and Half Dome Village Gift & Grocery. You will never be too far from the essentials. There are a variety of different places to dine in Half Dome Village. Enjoy the casual dining ambiance at Half Dome Village Bar, Half Dome Village Pavilion, the Meadow Grill, Pizza Patio and Coffee Corner. There’s no shortage of filling bites and friendly faces. Looking for something a little more romantic? Yosemite National Park offers restaurants near Half Dome Village including anything from quick lunches to intimate tables for two featuring locally-sourced, organic and sustainable ingredients whenever possible. Look for outdoor seating in the summer months to really take in the area while you relax and recharge. Half Dome Village occupies a central position in the area, spanning about one-mile in length. You can access Half Dome Village via Happy Isles Loop Road off Southside Drive. Half Dome Village is near Yosemite Village and Yosemite Valley Lodge. Depending on where you’re coming from, the area can also be accessed via Pines Campgrounds near the Mirror Lake Trailhead. Whether you get to the park by bus, car or train, there will be an easy route to get to Yosemite National Park’s Half Dome Village. Travelers flying into California can rent a car from San Francisco or Sacramento and drive three to four hours to the park. 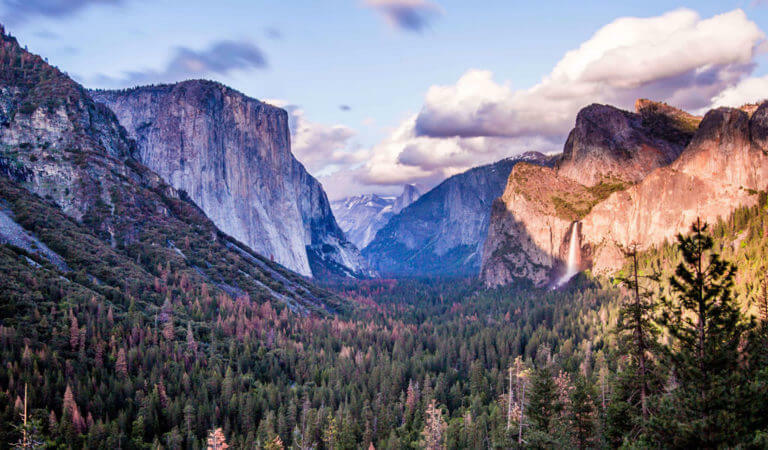 Once in the Yosemite region you can opt to take the Yosemite Area Regional Transportation System, or YARTS, that provides bus service and will happily guide visitors to Half Dome Village and the surrounding areas. While there is free parking in Yosemite National Park, it is limited. Take advantage of the YARTS and enjoy the scenic journey to the park gate. On the Yosemite Valley floor, the shuttle bus system will get you everywhere you need to go without having to worry about parking. Cars pay an entrance fee of $35. The public roads in Yosemite National Park are maintained year-round, except for the east entrance on Tioga Road via Highway 120 through the park. Tire chains are usually required from October to April, so make sure to have some in your trunk if you plan to visit during the colder months or rent them. Don’t forget to check Yosemite Road Conditions Resources for the most up-to-date information and possible advisories from the Park Service. While you’re staying in Half Dome Village, don’t forget to check out the Half Dome Trail. Half Dome is Yosemite’s most quintessential attraction and the trail is carefully managed by the National Park Service due to its length and difficulty. The trail to Half Dome from Yosemite Valley is an extremely rigorous hike, covering over 17 miles. 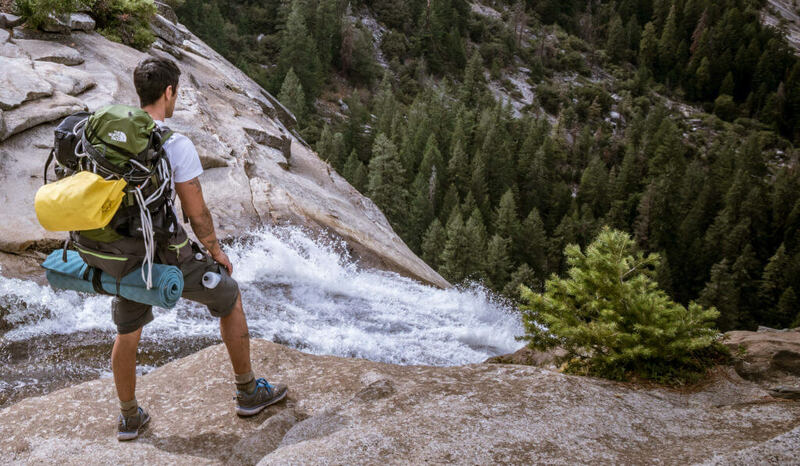 Hikers gain 4,800 feet of elevation along the trail on which they will see Vernal Fall and Nevada Fall before reaching the cable route to Half Dome’s steep granite domes. Steel cables and wooden planks are placed along the dome to assist the hundreds of people making the trek to the summit during the summer. The cables are removed every October and replaced in late May. Half Dome is the only day hike that requires a permit. A Half Dome permit is required seven days a week. If your bid for a permit during the preseason lottery (March 1 through the 31st) is successful, you will be notified in mid-April. There are also daily lotteries (approximately 50 permits) during the hiking season with an application period of two days prior to the hiking date with a late night notification within the same day you apply. It is important to remember to bring plenty of water if you’re planning on hiking to the top of Half Dome. This trail is not for beginners or novice hikers. Several people are rescued each year on this hike, most suffering from dehydration. It is important to understand your limits as a hiker and plan in case of an emergency. Rigorous hikes aside, there is always something to do no matter what level of exploring you choose. From biking in the Valley to bucket list accomplishments like Half Dome Trail, Half Dome Village has something for everyone to enjoy. 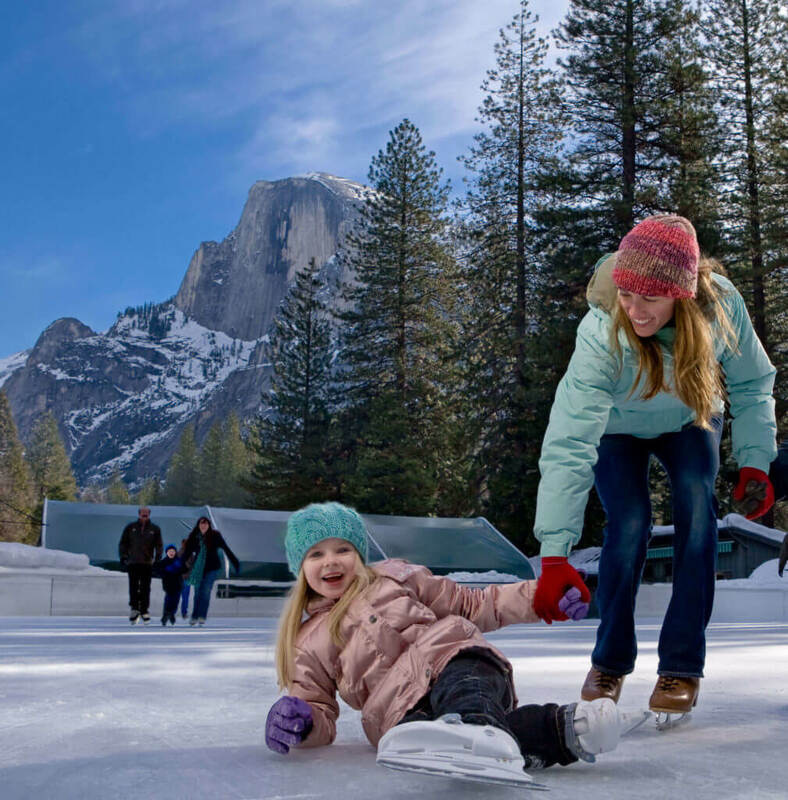 Check out Half Dome Village’s many amenities and start planning your trip today.